This post contains affiliate links. If you click through a link with a * and make a purchase, I may receive a small commission. I never recommend a product/resource I don’t use myself. If you’re committed to parenting your children in a way that brings them closer to Jesus (what I call “discipleship parenting“), worship and prayer time will be an essential part of your daily routine. Making it a habit, if you have not already done so, will change your life, and the lives of your kids. Daily family worship is the best way to begin teaching your children how to praise God, learn about His character from the stories in the Bible, and to pray for and with one another. 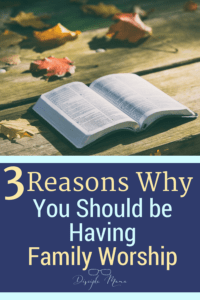 Are you having family worship? Family worship isn’t difficult to implement, but it does take commitment. George Barna, in his book Transforming Children into Spiritual Champions: Why Children Should Be Your Church’s 1 Priority ,* (which is excellent, by the way) writes that (as of 2003) only 1 out of 20 families were having family worship in a typical month, even though 85% of parents believed themselves to be primarily responsible for the moral and spiritual development of their children. I don’t know about you, but that statistic is astounding to me! If we are to influence our children to form personal relationships with God, we need to show them how, and family worship is the way to start. 1. Having family worship invites God’s presence in your home. Matthew 18:20 tells us that God is there when 2 or 3 of us come together in His name. Where better for God to be than with your family? It’s comforting to know that we have this access to our heavenly Father. If you make inviting God’s presence a regular thing, your children will notice when it doesn’t happen and they’ll miss it. 2. Having family worship ends the day on a positive note. This only works if you have family worship before the kids are past being able to function for the day. I don’t know about your kids, but mine get to a place at the end of the day where they can’t be happy, even if I give them ice cream and a new puppy. Don’t leave it to the last part of the bedtime routine, or it will often be a miserable time. The thing is, if worship isn’t positive, it isn’t worship. No, you don’t have to do crazy elaborate things every night. Choose what works for you as a family and keep it short! For my bookworm toddler, we read a Bible story every night and then pray together (he prays first, then we each take turns). Sometimes we sing a song, but we’re singing our praises all day long (my babies love music, what can I say?! ), so we don’t feel that we need to add any songs to the routine before bed. But, I know for some people music is the focal point of their family worship, and that’s great! Do what works for you your kids to make worship a happy way to end their day. Then, when the teeth are brushed and the potty trips have been taken, and you’re tucking your kids in, you can remind them of your worship thoughts and that God loves them and you do too. Focus their minds on Him one last (very brief) time before you leave them to fall asleep. 3. 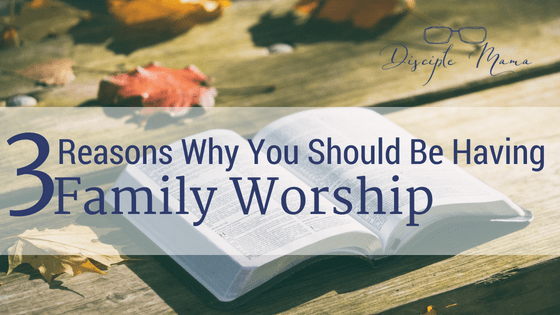 Having family worship helps your kids form good worship habits. Your kids won’t always be home with you. Eventually they’ll go to school or grow up and move out. While you’ve got them, make a habit of having family worship. Start when they’re too young to even know what’s going on, and then just keep it up. They’ll never remember a day without family worship! That way, it’ll stick even when the kids are in school and music lessons and sports, and you don’t have a lot of time together. It just may keep sticking when they’re off, married, and have kids of their own. Worship needs to be a priority, which means it doesn’t get skipped when your routine is off. Have worship together earlier in the evening when you know bedtime will be crazy, or include your guests if it’s bedtime and they’re still around. Have intentional worship time together in the car if you’re still on the road. You can figure it out! Be flexible when conditions change. Time and location are irrelevant to being able to praise God and connect with Him in prayer. One day, you won’t be able to daily gather your family for worship, and you’ll have to trust your kids to prioritize God for themselves. Remember what I said about the kids missing worship when it’s not there? If you’ve formed a solid foundation for making worship a part of every day, your kids will know what’s missing when it’s not laid out for them anymore. This is where the early work you’ve done to help equip your children to have personal prayer and devotions and to lead out in family worship will really come to fruition. Start having family worship today! If you’re not already having daily family worships, it’s not too late to begin! Remember, it doesn’t need to (and shouldn’t) be long or fancy. Take the first step and your family will be blessed. Already convinced you should be having family worship, but need practical tips or resources to make it meaningful? 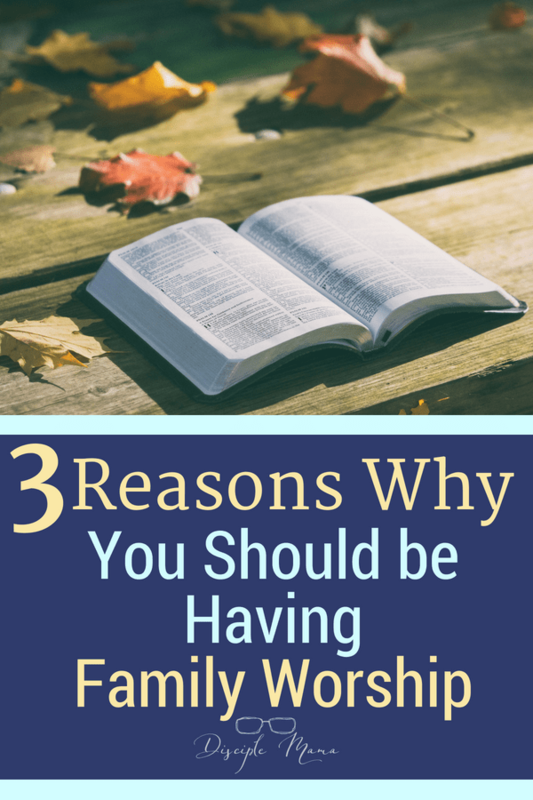 Read my post with tips for meaningful family worship with young kids to get you started! Subscribe to the Disciple Mama newsletter. I know that with crazy schedules doing something like this regularly is difficult. But even if you can’t do it at the same time every day, it’s worth a try to carve out 10 minutes whenever you can! God can make a way! Thank you so much for visiting my blog, Lacy! Donna expressed my sentiments exactly! And I’m holding on to these thoughts and ideas for use with my Grandkids some day. I’m so glad you enjoyed the post, Donna! Thank you for your response. God can indeed redeem all things! Thank you for visiting my blog! Intentional times of family worship is something I want to do so much with our family and yet I always manage to push it way down the list. Thank you for this encouraging article! It’s so easy to push worship aside when other things fill up the day, but I honestly think it’s one of the most important things you can do with your kids. I am glad you feel encouraged, and I hope you’ve been able to find a way to make it happen! Thanks for visiting my site today, Amber. When our first was little I was adamant we had to have prayer as part of her bedtime routine. But schedule changes and a new baby and now we usually only have family prayer at breakfast and dinner. This is another nudge that I need to get family prayer back into our bedtime routine. Pinning this for reference for later! Hi Sarah, thanks for visiting my site! I hope you’ve been able to work family devotions back into your routine! Blessings! I have started really looking forward to this part of our day! Our 17 month old is starting to initiate worship time and always wants to make sure anyone in the house is involved in the closing prayer, reaching out open hands to invite them into our prayer circle. It is precious and I love to see the beginnings of a relationship with Christ growing. An added bonus has been when she stops me throughout the day, has me kneel with her and closes her eyes to pray. It happens at the most random times and it is humbling to see how, without even being able to talk yet, she is teaching me to take moments during my busy day to reconnect. It’s so incredible how God uses our kids to help us grow spiritually as we try to help them, isn’t it? I love it! Thanks for sharing. Such powerful advice to start when they are young before they know what you are doing. We have watched our older children choose to continue, fall away, come back, make their own worship routines. But if they don’t have a model to reference starting as a teen is difficult. Why is it that good habits are so much more difficult to form than bad ones? It makes sense to start early if you can. If not, better late than never! Thank you for visiting my blog, Elaine. Come back again soon! Excellent article and a definite important topic. Its so good to begin and end each day with Jesus. I’m so glad you enjoyed my article! Thank you for visiting my blog, Jessica, and come back again soon! This is so true. I have seen the difference family worship makes in a family. Keep up the good work – yourselves and that of encouraging others to make it a habit in their homes. Thank you for the encouragement, Beth! We know it makes a difference for us, and I hope to be a support to others so they can reap the rewards of family worship, too! I am glad you visited my blog again! Yes! You’re exactly right, Michelle! That shift in focus is so important! Thanks for visiting my blog today! In our family, this has always been a natural part of our daily life. Edna, I think you’re right! My kids are grown now, and we didn’t have family worship (except on Sundays at church.) I think, if I could turn back the clock, I’d do what you suggested. Maybe I can encourage my kids to incorporate this into their family life someday when they’re married with children. Great post! Thanks for visiting my blog and leaving your thoughts! I think it would be a great thing for your kids to do this with their spouses and children in the future! Family worship… what a GREAT idea! Thank for for the tips and the motivation. Jessica, I’m glad you like the idea! We love our family worship time! Beautiful and encouraging post! It has motivated me to be more consistent with family worship. Thank you, Jacquelyn! I’m glad you’re encouraged by this post! I’ve been enjoying your posts on family worship, too!